Visual Studio is better for some things than Blend (e.g. 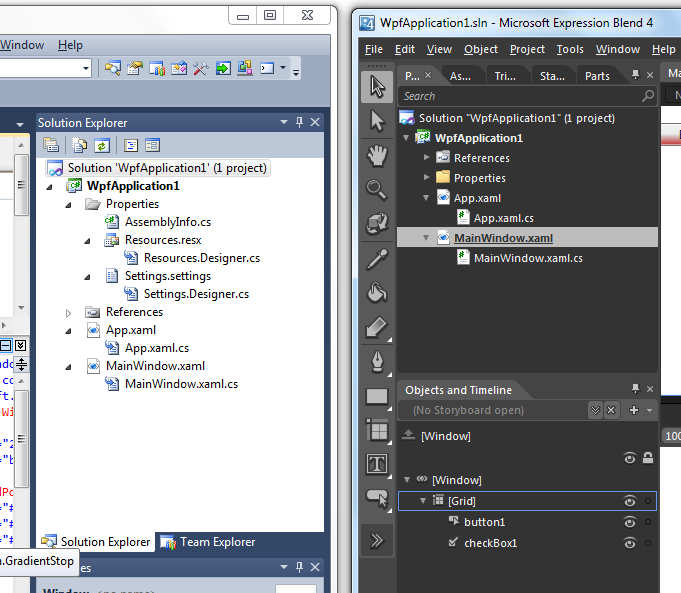 writing code) and Blend is better than Visual Studio at other things (e.g. changing layout). This means that you may often switch back and forth between the tools. However, instead of closing and reopening the project every time, you can have the project open in both tools at the same time. This is typically not a problem, since you’re likely not changing the same file in both tools. If you do happen to have the same file open in both tools and you make changes and then save your changes in one tool, the other tool will warn you that changes were detected. The tools will warn of changes only if you happen to have the same file open in both tools.